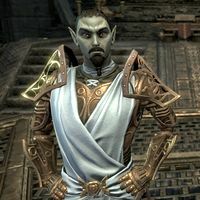 Alienist Llandras is the Dunmer caretaker of the Asylum Sanctorium, where he cares for Saints Felms, Llothis, and Olms. He can be found in the atrium of the Asylum Sanctorium along with two Asylum Orderlies, and will give you the quest to remove the black soul gems from the three Saints, as well as explain the reasons and circumstances as to why. Saints' Mercy: Neutralize a threat within the Asylum Sanctorium. "If you have come to pay your respects, I'm afraid I can no longer allow visitations. My wards have become too unpredictable for unfamiliar company. Truth told, they struggle to find comfort in the routine now as well." Is this place some sort of house of healing? "This is the Asylum Sanctorium. A sanctuary for the troubled Saints of old to convalesce, but their hopes of recovery have long past. I simply provide what comfort I can and keep them from harming themselves or others. That too may be beyond me soon." "The madness that erodes their minds seems to grant frightening power to their mechanical bodies. I can no longer keep them calm and stable, nor do I have the power to overcome them, should they escape this sanctum. I pray Seht will grant an answer." I'm willing to help. What do you need done? "It is no longer a matter of if the Saints will lose control, only a matter of when. The threat they pose is too great a risk. The black soul gems powering their bodies must be removed, by any means necessary." Who are these Saints you watch over? "Three beloved contemporaries of Seht: Saint Olms, Saint Llothis, and Saint Felms. My people hold our ancestors very dear. We seek their wisdom and their blessings in all things, the Saints most of all. Through them, we better understand our gods." Won't it anger the Temple if I harm these Saints? '"You have nothing to fear in that regard. Outside the Clockwork City, these Saints are believed to have long since passed and when Sotha Sil entrusted us with their care he knew the experiment would have to end eventually." How did the Saints come to inhabit machines? "There were no people closer to the living gods as the Saints, but those mortal connections would inevitably drift away with the current of time. Sotha Sil pondered this and designed his confidants a kind of immortality. Thus the experiment began." "The Tinkerer mastered life and death, binding the souls of the Saints into pristine black soul gems and creating machines that could harness their power. The experiment seemed a success, but while body and soul remained whole, the mind fractured." Any advice on how best to subdue them? "Saint Olm's Righteous Chassis allows him to beckon other animunculi to his aid. Unless you believe you can overtake all three Saints at once, you may wish to isolate and deal with Felms and Llothis first. They are presently roaming the upper atrium." What will happen to the Saints when their soul gems are removed? "What is the fate of any being bound to a soul gem? In a sense, their lives will end, but the quality of their existence is such that ending it is a mercy. I will care for the Saints, in whatever form they take, until Sotha Sil bids me otherwise." "Only the Father of Mysteries can answer that. I have no doubts that Sotha Sil will do everything in his power to see the Saints mended. Until that time comes, trust that I will ensure their safety." "Such sounds of pain, anger, and suffering. I'm glad that they have finally fallen silent." It should be safe to remove the Saints' soul gems now. "You have done a great service today. For me, for the Saints, for the Three. This place can become a place of healing once again. There is a long road ahead, but take this with my gratitude." When spoken to again after completing the quest, Alienist Llandras will inform you, "The Asylum Sanctorium will remain closed for the time being, until I've safely secured the Saints' soul gems. I may open it to mortal patients again, now that I no longer need fear for their safety." You can then ask more questions about the other patients, Sotha Sil, or about the Saints. You had other patients in the past? "Before the Saints fell so deeply into their madness, my predecessors tended to the mortal minds of Clockwork City's denizens. Those who had trouble adjusting to this unique realm, or who's work exposed them to things beyond their comprehension." "It is not unusual, no. Those used to dwelling in more vibrant places are most often afflicted with crippling melancholy, but everyone settles in differently. My fellow apostles are most at risk peering too deeply into reality for their own good." Can you accept a new patient now? Proctor Sovor Saryoni just had his soul bound to a factotum. "Sovor, you say? I believe he consulted with my predecessor. There was some tragedy—an experiment gone awry. A young prodigy had to be expelled from the order. The study of black soul gems was forever barred, or so I thought. He was dying, and thought the experiment might save him. It seems like it was successful, so far. "He's lucid? Not lost in the past, or out of touch with reality? That does sound promising, but only time will tell if his mental faculties are stable. The Saints were not always as you saw them, but their abnormalities were obvious from the start." It'd be best if you could keep an eye on him. "Agreed. I'll keep Sovor under observation. We have the facilities to contain him if he proves to be a danger to the city. I truly hope his attempt was successful, both for his sanity and the sake of progress. Thank you for sharing this with me." How long has it been since Sotha Sil visited here? "Not since I inherited my duties. He walked among the Saints for a day, in peace, as if nothing had changed between them. Perhaps nothing had. It felt like a moment out of time. He will return, I'm certain, but the concerns of a god are many." Why were the Saints created to be so dangerous? "They were powerful heroes in their time. They were always meant for grander things. To grant them everlasting life in unremarkable bodies would have done them a great disservice." And after they proved unstable? "To meddle further was to risk doing even greater damage. It was always the hope that the Saints might one day recover, or at least achieve lasting stability. Altering the experiment was intended to be a last resort." Alienist Llandras: "Saint Felms was a proud, noble warrior, but in his battle to conquer death the only casualty was his humility. He aspired to great things, but also terrible." Saint Felms the Bold: "I walked with gods. My mistake was believing I could keep up." Alienist Llandras: "There is no weakness in this needed rest. By Lord Seht's will, you may walk with them again." Alienist Llandras: "Saint Llothis, beloved of the Three. If any could claim to have known the hearts of the Living Gods, it was him, but for all his wisdom he couldn't see what had changed between them." Saint Llothis the Pious: "This was not an extension of my existence, but a transformation. I can see that now." Alienist Llandras: "Perhaps we pulled you too early from the cocoon. Go back and rest, until Lord Seht finds the true shape of your soul." Alienist Llandras: "It may have been more fitting for the three Saints to depart as they arrived, in unity, but I'm glad Olms was not alone in the end. The burden of their existence weight heaviest on him." Saint Olms the Just: "It grows lighter as this body fades." Alienist Llandras: "Holy one, let others carry the burden now. I cannot make you whole, but I will offer you comfort until Lord Seht has unraveled the sacred puzzle." Lector Trivura: "Alienist. I'm told the Asylum Sanctorium is returning to order. So much a such a place can be." Alienist Llandras: "We all wrestle entropy in our own ways, but yes, the Saints are at peace in their shrines now." Lector Trivura: "So you say. Can you truly claim they are at peace within their crystal confines?" Alienist Llandras: "I only know that they are quiet and their prior existence was one of anguish. Improving their condition is, as always, my endeavor." Lector Trivura: "A worthy one. How might I aid the Saints as well?" Alienist Llandras: "Come, visit, pray to their shrines. I believe earnest faith helps mend their bridges to the divine." Lector Trivura: "An interesting theory. I look forward to testing it." This page was last modified on 3 March 2019, at 18:35.